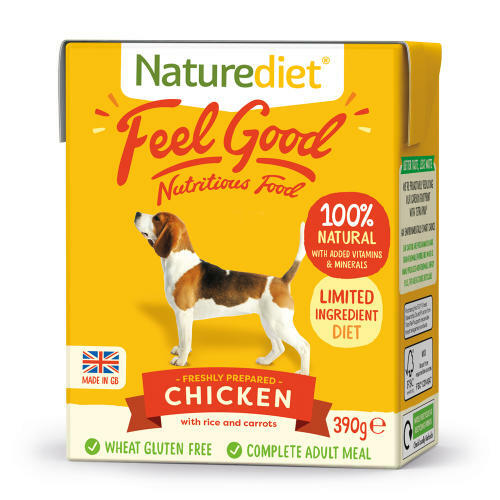 NatureDiet Feel Good Chicken is naturally delicious wet food that's made to a delicious recipe of freshly prepared British chicken, carrots and rice. This complete and nutritionally balanced meal is 100% natural and contains all the essential nutrients your dog needs for a healthy diet. Gently digested and highly palatable, this tasty single protein chicken meal is suitable for all breeds of adult and senior dogs, as well as puppies over 6 months old.Appropriate for dogs requiring a low purine diet and those suffering from sensitive digestion and allergies.Available in 390g.